Legend says that the name "Zenith" arose when Georges Favre-Jacot ventured out into the Jura Mountains one evening in 1865 - looking for inspiration for the name of his newly created caliber. While star gazing, his attention was pulled to the Polar Star, which was visible at the zenith. And, hence, the name was born. Regardless of the veracity of this story, the fact remains that Zenith is one of today's stars in the sparkling galaxy of fine watchmakers. By 1875, Zenith was a leading manufacturer of pocket watches, clocks, and pendulum clocks. In fact the word "manufacture" was an original concept of Favre-Jacot; he built a facility that allowed his artisans to work together under one roof - with adequate lighting and heat to allow the workers to focus full attention on their craft. The company's most exclusive operations were focused on creating navigational instruments for the navy. Eventually - and inevitably - the company ventured into the wristwatch making arena and has now won more than 1500 first prizes for its innovation and design. * Zenith is one of the rare watchmakers that have been able to produce chronograph calibers with column wheels and integrated self-winding systems set within the movement of extremely flat watches. * The caliber El Primero was created in 1969 and is referenced around the world. It runs at the high frequency of 36,000 vibrations per hour with 13 lines and only 6.50 mm thick. * Zenith continues to introduce new designs and patents each year. For example, in 2002, the company introduced four new movements, 14 new models, and 52 new references. Grande Port-Royale: El Primero 4002 As a symbol of excellence, the El Primero 4002 was the first automatic integrated chronograph movement ever created. It is capable of measuring short time intervals to a tenth of a second. This new 4002 caliber has a slightly modified positioning of the functions, giving to the Grande Class a dial with two counters. This watch is water resistant to 50 meters and available in a stainless steel or rose gold case, with black or silver guilloche dial, and black or brown leather strap. Chronomaster: El Primero 4021 This watch features an automatic movement with chronograph and power reserve indicator. The open trilogy dial comes in deep black, metallic grey, or luminous white and shows the escapement mechanism in a traditional guilloché work. 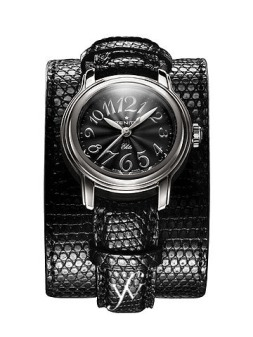 The case is stainless steel with a sapphire caseback and the black leather alligator strap has a triple folding buckle. Grande Class Rattrapante, Grande Date: El Primero 4026 With an automatic movement and split second, this timepiece features a big date and is water resistant to 50 meters. This watch is available with a white gold case, cobalt dial, and black alligator leather strap with a triple-folding clasp.